Being constantly chased and never far from civilisation, the South Coast Rusa have adapted to become one of the smartest deer species in Australia. They certainly are one cagey animal and a tough adversary when it comes to hunting them. My mates, in particular Pete Novakovic, and I put a lot of time and effort into knocking these guys over with a bow. Here is a bit of an insight into the methods we employed this year that led to four good heads on the ground. First of all the biggest key, which played a part in all three successful hunts, was to get out in the off-season to cut trails. Rusa just love lantana and hunters just hate it, but neither would be around in the numbers they are if it wasn’t for this dreaded weed. So the best way to get to them is to cut nice clear trails through it. This enables you to gain access bedding areas, travel routes or to set up ambushes as animals leave feeding areas. We employ machetes and branch loppers and get stuck into it regularly, especially when scouting unveils a new clearing or wallow. Advantages of cutting trails mean that you can access areas quickly and quietly, using the lantana to hide your approach. You can also make different trails to the same spots in order to give you options in different winds. They are also of great benefit when recovering animals as clear pathways mean freedom of movement under a heavy load. Deer will also take to using your trails’ too, so maintaining them is usually not too hard. Initially it is hard yakka but the rewards are well worth it. Now to the hunts. The first stag of the season fell to Pete. This stag was a malform with one very nice antler and the other a cluster of three points that formed low on the left side. We had glassed this stag all through its velvet stage and knew its habits well. He was also in the area last year but was not as impressive. He was a very territorial deer and stuck to the same corner of the farm that provided very little cover for approach. What cover there was, was usually backed by prevailing winds and was very noisy to move through. He usually hung about in the mornings for a feed before heading up into the lantana. He would come out again after midday to feed and bed in the afternoon sun, always surrounded by smaller stags and does so he was very well protected. Once he started to rub out, many hours were spent on the opposing hill glassing him and waiting for him to leave himself in a vulnerable position to justify a stalk. Three times the decision was made to go in on him and three times he’d beaten us to the punch. This guy was sure going to take some beating. I knew exactly what he meant and was out there in a flash to meet a smiling Pete. He hadn’t gone to look for him yet, but knew the shot was good, so off we went to trail him together. He had glassed him with only two does right at the head of our trail and the wind was perfect to use it. Quickly skirting around the property, he was in position in 10 minutes. 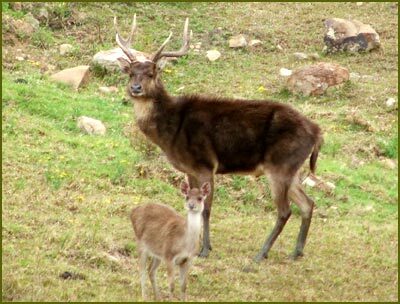 The stag was trailing the two does into the lantana covered hill when he paused in a clearing under a tree at 40m. Pete let fly struck tight behind the shoulder on a quartering away angle. The arrow exited through the lower neck area and the stag turned and ran back down the hill into some more lantana where Pete lost sight of him. We went to the hit and found a lot of blood on the arrow. At first there was not much on the ground - and we were a little concerned. But then it started. A continuous blood trail 6 inches wide for 70m and at the end of it laid the biggest bodied deer I had ever come across. I always thought he was big on the hoof, but now on the ground was a different story. And that antler too! With a slap on Pete’s back, he knew he had achieved one of his greatest goals. The 160kg beast was not easy to move but we managed to recover him whole, much to the farmers delight and our backs demise. His good antler came to 32 inches long and the arrow had passed through heart, lung and carotid artery. A dead run it was. Bush bashing is usually a fruitless way to nail a Rusa. They usually hear you coming from a mile away and quietly vacate the area before you get within cooee. However when the wind gets up nice and strong, it is one the more successful ways to hunt them. Twig snaps and bush rustling noise gets swallowed up by the wind or ignored by the deer as they are hearing branches fall and leaves blowing around all day. Combine a bit of wet weather which makes for quiet ground cover and the prospects of coming upon unwary deer in bedding areas rise dramatically. Such were the conditions when Pete once again (much to my chagrin, just joking) came to have his second nice stag for the year. Being a renderer, rainy weather in the rut is a blessing as all it means is it’s time to hunt. We have scouted all over the shop and found many out of the way clearings and bedding areas that are normally very hard to get to and receive very little hunting pressure. But we know that the deer love these spots and it was one such ridge that had several connecting clearings that were to be targeted that day. Normally the stags hang low in the rut, around large clearings, but when the wind is up they prefer to head up this semi-sheltered ridge and belt out roars all day long. Pete came across several deer on the lower clearings but passed them all up. As he came upon the last clearing, a nice 27 incher and two smaller stags were feeding among several does and fawns. One of the smaller stags busted him as he was preparing to shoot the 27 incher and took off. All the deer got a little nervous when suddenly a huge roar burst out from the lantana behind them and out strutted a large antlered stag. It immediately stamped its authority, scattering the two remaining stags. The rest of the deer settled, as they must have assumed that the first stag’s departure was due to the big one. Pete went through the shot sequence and the result was almost identical to the one antlered one, 40m behind the shoulder, quartering away. Only this stag only made it 10m and fell in direct sight. Once again Pete rang me and I was there. There was no way we could get this guy out of there whole so we caped and quartered him and shared the load. Not a lot of fun I can tell you as he reeked of the rut and weighed a tonne. The worst part though was that my camera batteries were flat when I got there so no pics of him whole were taken. He had small outers but went a sweet 31 inches each side and had quite heavy tops, an old stag with torn ears and plenty of character from years of rutting and fighting. His head was really quite brutish compared to the other one. Even the taxidermist couldn’t believe how fat his head was. Finally it was my turn. I had been quite crook for most of the rut and didn’t really get into the hunt till very late in the year. The tactic that paid off for me was to wait in ambush as the deer leave their nighttime feeding areas, as the first rays of daylight creep over the horizon, and head into the bush to bed for the day. We had spent many an early morning glassing deer all over the place before work. The main aim was to pattern various stags and work out their travel routes. We wanted to plan places to wait in the hope that they would stick to their habits come the weekend. I tried for a few weeks in one spot but came up empty as the wind would shift, or the deer would walk into a completely different spot to where I was sitting. This was despite near perfect conditions and watching them do the same thing day in day out. Very frustrating. While sitting in wait I would glass another spot (I had my eye on) and would occasionally see a few stags linger around for a bit after first light. I thought that I would give it a shot the next morning. Headlamp on, steam coming back to my face as I exhaled, I made my way down through the bush. I was walking through the deer’s destination in the hope of intercepting them before they got there. As I came to edge of the clearing, I pulled my binos out and spied about 40 deer feeding their way up the ridge to where I was. Perfect. I slipped back to the other side of the ridge and made myself comfortable in some lantana at the base of an old, dead tree. Now all I had to do was wait. The deer were all going to pass between 20 and 40 meters. They had nowhere else to go. After 15 minutes I started to get a little antsy and was itching to sneak a peak back over the ridge to see if they were still coming. Luckily, common sense prevailed and it was not long till I spotted the first bit of movement. And it was the white tips of antlers. I tried to range him but only had his antlers and the top of his back in view. Slowly he fed up and I eventually got a reading at 27.5 meters. I stayed behind the tree and drew back. As I stepped out to clear the lane, the stag looked down at the deer behind him then directly at me – now at full draw. He thought nothing of me and glanced up the hill for one last time. I touched the release and took him through the shoulder. In an instant he whirled and disappeared back down the ridge. I ran to catch sight of him and saw him come to a trot with the others. He looked unaffected. At first I panicked and thought that I may have missed, but doubt quickly turned to elation as he faltered to his front knees, got up, then rolled over twice and came to a rest. The other deer thought nothing of it and continued to feed around him. A couple even bedded with him. This time it was my turn to ring Pete and he was jolly on the spot in no time for photos and video. It was 5.30am mind you, but he owed me. Not that his wife agreed. He was no monster by any standard but he was certainly my best to date at 26 1/2 inches so I was very happy with him and relieved to have finally gotten a decent one after all the effort. He also had a couple of extra points on the bases of his brows, which made him a little unique. Using a combination of all three styles in the one hunt proved successful for another mate of mine, Frank Lucic. Frank had every intention of getting up early for a bush bash, given that it had for three days prior. He had a trail and clearings in mind that he had gotten into on previous occasions for great success, but no deer were present when he arrived. Not wanting to give up he headed up a hill and proceeded to glass. He was still in position early enough to see a few deer out feeding. Spotting a nice stag among a mob, he decided to try to intercept them as they entered the bush. He ran down and got in position a good 10 minutes before they were due to pass him at 40 to 50 meters. Sure enough, as the stag passed his window he hit it perfectly through the shoulders. Frank spent 4 hours finding this stag. He was sure he was in the lantana as that was the direction it was heading after the hit. In the end it had turned 90 degrees and ran down into an open paddock, only to expire in a depression next to a dam, hence the reason why he didn’t spot it earlier. He was very relieved when he finally found it, but very frustrated that it was a mere 80m from where he had spent the last four hours on hands and knees looking for sign. This was another beaut stag that tipped out at 29 inches. Frank’s versatility paid off. He could have left after his original plan fell through, but stuck at it and came up with the goods. These stags were taken employing a different method for each and it pays to put in the effort and diversify your methods regardless of what species you are targeting. If you are a spot and stalker don’t just give up because its windy or rainy and the animals are not out. Have a back up plan. They have to be somewhere when the weather is ugly. If the game you are chasing are very hard to approach due to heading into the bush at first light, poor cover or prevailing winds, try a different angle of approach. Also if you are finding yourself traipsing around in the bush and coming across nothing - or a lot of spooked deer, try spotting and plan your stalks a little better. It all pays off in the end. Next year we are even going to try tree stands for the first time and hopefully that will lead to another story. I’d just like to add a special thank you to Frank and Pete for letting me share their hunts with you. Cheers and good hunting. 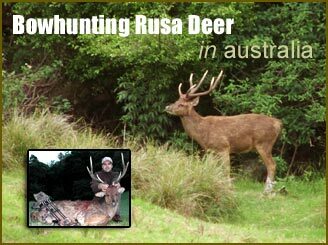 Rusa are free range in Australia and you can hunt them all year round. You do not need a tag and there are no bag limits. You can do it self guided or with a couple of reputable guys who run pretty successful hunting organizations that can be found on the net. All our deer were taken free-range and on our own - on land that we had permission to hunt on from farmers. After seeing some of the prices paid in the US, down here is very inexpensive. 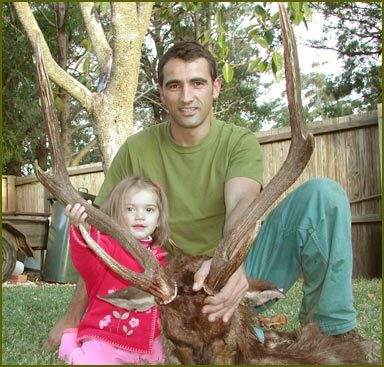 You can get a 5-7 day free-range hunt with two trophy heads, that's for a red deer and unlimited pigs for $2500AUD. The rusa, chital and fallow are even less expensive. Sambar hunting is mostly self-guided but there are some guides who don't charge much as they are all free ranging in the Australian Alpine country of the southeast. Most of the hunting here is free of charge. You just need to get access. No tags, no preference points and no designated areas. 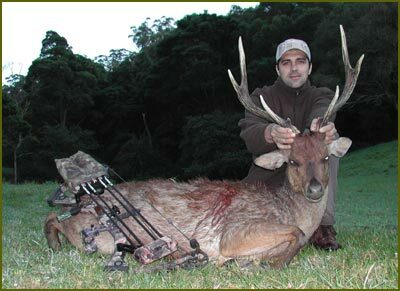 The only deer that has a short season requiring a ballot and tags is the Hog deer in Victoria. The government in NSW is starting to open up state forests for hunters under a $60/year license fee but that is the extent of it. Deer and all the other hunted creatures in Oz are declared pests and that is why it is so easy to hunt them. It is treated as feral animal control. About the Author - Antonio Lara is 32 years old, married with two young daughters and live in a place called Wollongong in New South Wales, Australia. He is a steelworker there. Antonio spends most of his free time hunting. 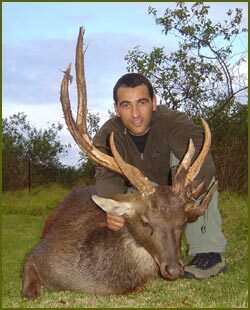 He also hunts Red, Fallow and Chital deer and is getting ready to chase the elusive Sambar deer in the Victorian highlands this year. Antonio uses a Switchback set on 70lb, mathews two piece quiver, G5 LE series sight, Mathews drop away rest, Doinker stabiliser, Gold Tip 5575 arrows tipped with Zwickey broadheads, Scott release, Carson 10x42 binoculars and nikon rangefinder and spotting scope.